Robert (Bob) Murchison Tucker completed his journey home on Thursday, April 4, 2019, to the welcoming words, “Well done, my good and faithful servant.” He was born on November 27, 1931 in Burlington, NC to Leslie Dewey Tucker and Helon Murchison Tucker. He was preceded in death by his parents, his brother L.D. Tucker, Jr., his first wife, Joann Newman Tucker and his great-granddaughter Joann Maria Burduja. He was educated in Burlington schools and he enjoyed playing football and baseball. In 1949 he was selected to play in the North-South All-Star football game. 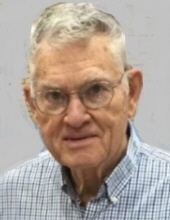 He attended Davidson College on a football scholarship and was a 1953 Phi Beta Kappa graduate. He was also a member of the Beta Theta Pi Fraternity. He was a member of Naval ROTC and was commissioned into the Navy upon graduation during the Korean War conflict. Bob spent many years in leadership at First Presbyterian Church in Goldsboro as an Elder, a member of the “Tuesday Troubleshooters,” and was involved in missions of the church, which included mission trips to Africa on 10 seperate occasions. Recently, he was a member of Crossway Church of Goldsboro. A memorial service will be held on Tuesday, April 9, 2019 at 5:00 PM at Cornerstone Church located at 401 N. Oak Forest Road, Goldsboro, NC. The family will receive friends following the service. Interment will be at a later date in the Eastern Carolina State Veteran’s Cemetery. To send flowers or a remembrance gift to the family of Robert Murchison Tucker, please visit our Tribute Store. "Email Address" would like to share the life celebration of Robert Murchison Tucker. Click on the "link" to go to share a favorite memory or leave a condolence message for the family.